From my perspective the compressed version of the anarchist credo is “You can do what ever you want as long as you are willing to take responsibility for it.” This does not mean if you trash the computer which is guiding space weapons systems you need to hang around along enough for the authorities to come arrest you. This responsibility for your action is defined by the person taking the action. i get that this is a dangerous definition especially for people who have far more wealth than the people around them. i have a thing about fences. 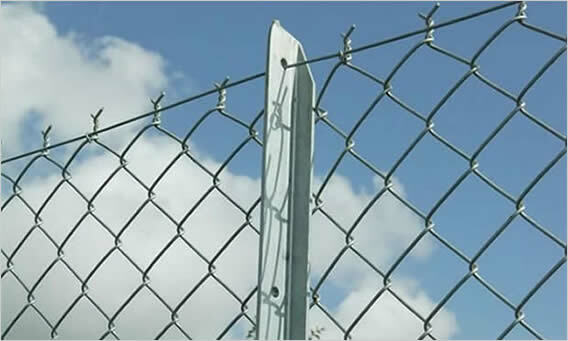 Like a moth drawn to a flame, with fairly minimal provocation i will climb or jump a fence. And so it was the other day after my massively successful dumpster diving adventure with Feonix and Steve at absurd o’clock, i needed to pack up and get on the road for the rest of my sales trip. I got as much of our rescued food into the rental car as it could hold (given it was already jammed with Angie’s stuff from Philly that i was moving). And since everyone was gone from the Keep, i had to go out the back door to maintain the necessary level of urban security. I walked through the back alley in the direction of the car, only to discover that since i packed it, the owner of the parking lot which separated me from the vehicle had closed the fence and locked it. I did a quick scouting to see if there was an easy way to get out of the lot or around this blocking fence, but there was not. So i scoped the fence and it had wires pointing up at the top for much of it. Rather than spend the perhaps 10 minutes it would take to walk around the block to avoid this fence, i went up it. And at the top i got caught and these wires tore my pants and took several small bites out of my thigh. 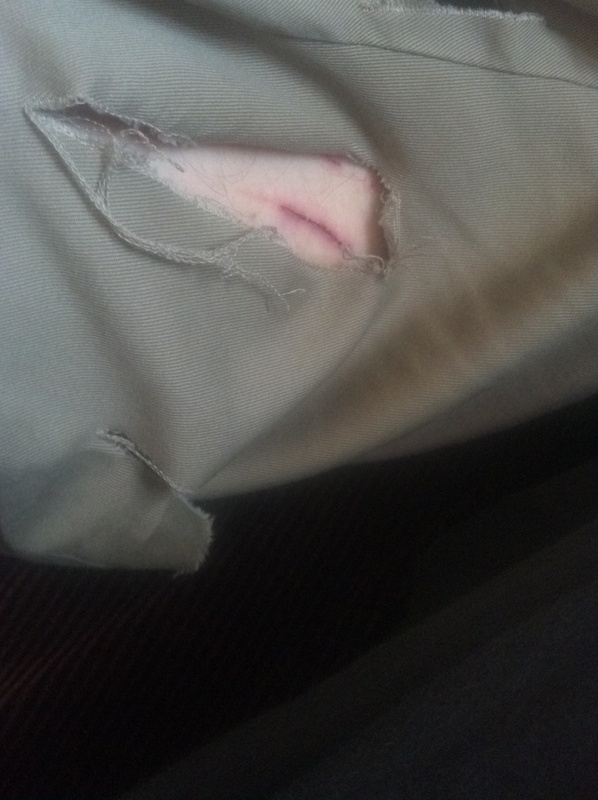 And as i got into the car laughing at myself for destroying these pants (which will likely get converted into shorts) i realized that even with my technical failure, i did not really regret my choice. It was not that i really needed the time, it was more that this kind of petty rule breaking keeps me “honest” in my belief set. And of course there is the story value as well. Anarchy, as you define it, is a nightmarish concept. That guy who murdered about 87 lefty Norwegians because he thinks they’re Islamicizing the country was eager to take responsibility for his actions — not just by his own terms of responsibility, but by society’s too (he just got off with a 21-year sentence, in a three-room cell with a TV and a computer). I’m not saying anything about other systems of governance or about other definitions of anarchy, but the one you’re using leaves me cold. i certainly see your point. And it is perhaps worth noting that the person responsible for this crime does not identify as an anarchist (tho he does refuse to recognize the state and courts which convicted him, an anarchist type of perspective). i am curious if you have a definition of anarchism you prefer? i dont think it is personally enuf just to be an anarchist – one needs to have other belief sets to guide as well. And perhaps my definition is too simplistic in its effort to be elegant. And just like one might be a vegetarian or a poker player and it not being a totalizing belief set, one could embrace this (perhaps over simplified) political identity without having it completely describe who you are. And context is important. It is relatively easy to be an anarchist where i live, and if you break out of the cultural rules of the place there are consequences. And because we are trust based, the system works best (at my place) when it is populated with anarcho-collectivists or anarcho-feminists. i am not attached to this definition. And while the place where i live has a non-violence clause as part of our guidelines, i am not excited about adding that to my definition of anarchism, because i dont want to necessarily give up this tool when faced with a state which is happy to deploy violence when it serves it. Life has always been very interesting for me whenever I jump a fence like that. Led to some wonderful discoveries, and a couple weekends in jail. Fences represent something I don’t like on a fundamental level. I climed over a medieval wall today to get into a lovely cemetary and castle ruin, only to find out that the gate wasn’t actually locked. I wonder about the metaphor here. My family once got locked in a museum and had to jump a fence like that. Also an amusement park.